The Ukrainian election: Sitcom or real life? Vasiliy the schoolteacher is late for work. He grabs his clock, he jumps out of bed, he shouts at his father, he begs his mother to iron his shirt. He burns the coffee. He bangs on the door of the bathroom they all share. Finally, he gets in — when suddenly there is a knock on the door. It’s his parents, speaking with changed voices. “Vasiliy, there is someone here to see you ...” He comes out. A slick, expensively suited man is in the hallway of his humble apartment, surrounded by bodyguards. “Good morning, Mr. President,” the man says. Silence. Stunned faces. Music plays, and the camera cuts to a black limousine, in a motorcade, speeding down a highway with Vasiliy inside. It probably hasn’t been said enough, but “Servant of the People,” the Ukrainian television series that has now launched the real-life political career of Volodymyr Zelensky, the actor who plays Vasiliy on the show, is brilliant. It’s just real enough to get viewers engaged, and just absurd enough to make them laugh. Its hero, Vasiliy, has been elected because a student has filmed him ranting, profanely, about corruption. The rant has gone viral, he has accidentally won, and now everyone — his unpleasant boss, his unsympathetic family — is suddenly obsequious, even sycophantic. Distant cousins start calling, looking for government jobs. Vasiliy is handed scripts to read and told what to say. Faceless oligarchs eat caviar, congratulate one another on his victory — “our people do love cheap populism” — and talk about how they will get him to do what they want. Slowly, Vasiliy learns to resist. But along the way, he mocks Ukraine’s parliament, politics and political language. He makes fun of the weird combination of respect and horror that Ukrainians feel for their leaders, and for their state. An anti-Frank Underwood [the protagonist in the American television series House of Cards] Vasiliy stands up for common sense in a way that appeals to Ukrainians, millions of whom want someone just like him to be president — so much so that 30 per cent of them have just voted for his creator in the first round of the country’s presidential election. 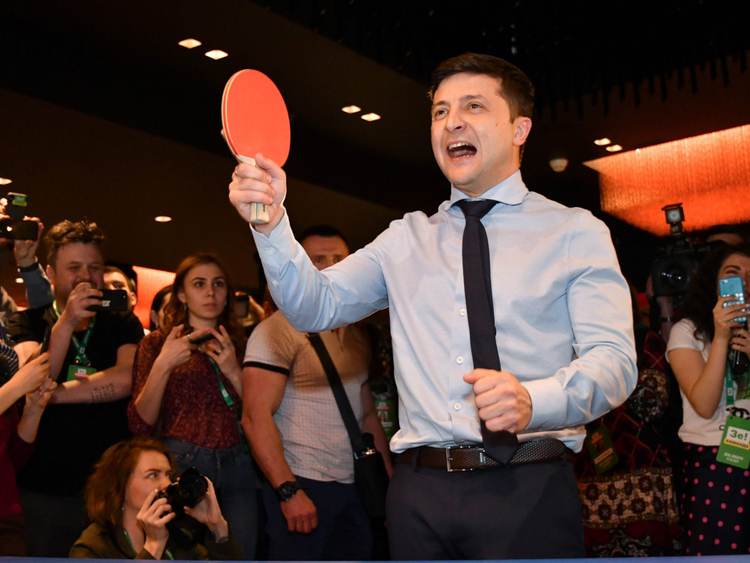 Zelensky is now in a runoff against the incumbent president, Petro Poroshenko, who trailed him with 17 per cent. Weird though this saga may sound, it’s unfolding against what observers agree is the background of a relatively free and fair democracy. Those monitoring the first round of elections last weekend observed fewer irregularities than expected. The candidate from the far-right party received less than 2 per cent of the vote, a lot less than extremists win in western countries. And many of the questions that get asked about Zelensky are in fact the same ones that get asked about any candidate, in any democratic election — especially candidates with no previous record. Is his public persona real or fake? Are the views he expresses when performing the same ones that he holds when he is not? We have no way of knowing. Zelensky gives few interviews, and only campaigns through his television programme. But then, we don’t always know what more conventional politicians “really” think, either; nor are we always sure that we care. Since most people consume political news the same way they consume entertainment, on their telephones or televisions, maybe it isn’t that odd that Ukrainians are treating a fictional campaign the same way as they would one orchestrated by spin doctors. More to the point, there are echoes of his success in supposedly more “mature” democracies, too. Some have compared Zelensky’s tactics to those of US President Donald Trump, another TV star who turned his celebrity into a political career and found unorthodox ways to spread his message. But unlike Trump, or Beppe Grillo, the Italian comedian who co-created the Five Star political movement, Zelensky is not seeking to divide people. On the contrary, one Ukrainian journalist told me she thinks Zelensky — who speaks both Russian and Ukrainian, runs a profitable production company and for years has performed in small towns all over the country — is perceived as a symbol of success and national unity in a country that has often felt divided. He appeals to people who are fatigued by Ukraine’s war with Russia or who don’t want to think about it. He does not hold angry rallies. Mostly, he discredits his political opponents by laughing at them. More sinister interpretations of his success can’t be discounted. Some are worried by his ties to one of Ukraine’s richest oligarchs, Ihor Kolomoisky, whose television channel broadcasts his show. Some fear Zelensky’s naivete: Ukraine is a country at war, a key geopolitical actor, a large and complicated economy that seems to require the leadership of people with experience in the real political world. His first real test could come in a televised debate with Poroshenko, which he has proposed, possibly thinking the president would refuse, to hold in the national stadium. If he can stand up in those conditions and answer questions about the war, the economy, foreign policy and energy policy — and if he can answer them as Zelensky, not Vasiliy, with a straight face — then he might stand a chance. Unless, of course, he just makes people laugh, in which case he might stand an ever better one. Anne Applebaum is a columnist and Pulitzer Prize winning author who has written extensively about Europe.